While I've previously written about political cartoons coining political words, like Gerrymander and McCarthyism, it isn't the only kind of word that political cartoons have been known to originate. Oddly enough, not only have political cartoonists gone on to create children's toys, but in the case of the teddy bear, a cartoonist was the inspiration for a toy craze that continues to this day. In 1902, President Theodore Roosevelt, known to most as "Teddy," travelled to Mississippi to settle a border dispute between that state and Louisiana. As a gesture of goodwill, and knowing the president's love of hunting wild game, the governor of Mississippi organized a black bear hunt. It lasted for a few days, but during that time Roosevelt was unable to find any bears himself. The hunting guides had been tracking a bear cub with their dogs for two days, and were finally able to catch and restrain it. Since the president hadn't been able to find any himself, and they wanted him to have a successful hunt, they brought it to him to shoot. That part of the story is generally known and accepted. Afterwards, however, the story gets a bit fuzzy, no pun intended. The popular story, and the one which was depicted in the cartoon, was that Roosevelt absolutely refused to kill the animal, as it was defenseless, not to mention mangy and worn out from being chased by dogs for two days. He felt it would be cruel, and entirely unsportsmanlike, to shoot an animal in that condition. It was an act of pure compassion which greatly impressed the American public and immediately endeared the president to them. The cartoon depicting the event was drawn by Clifford Berryman and ran in the Washington Post on November 16 of the same year. It was titled "Drawing the Line in Mississippi," referring both to the border dispute and to the refusal to shoot the bear. The real story, on the other hand, is a bit more complicated. Though Berryman's cartoon ran in the Washington Post, reporters from the Post were also present when the event took place and reported a slightly different story. They recounted that the hunting guides did bring a defenseless, tired, mangy bear to Roosevelt to shoot, and that he did refuse to shoot it, but that he still ordered it to be killed, one of the guides using a knife to do so. Interpretations of this action vary. Some who wish to still cast the event in a positive light claim that the act was still compassionate, as the bear was sick and dying anyway, and the president was kind enough to put it out of its misery. Others use the story to show that Roosevelt's portrayal in the popular story as an animal loving sportsman is far from the truth, because while he refused to shoot it, he still killed the animal instead of letting it live. Regardless of how people these days interpret the event, the interpretation of people at the time was clearly extremely positive. The cartoon was reprinted widely and appears to have been redrawn more than once for various publications. Most importantly, it caught the attention of Rose and Morris Michton, two toymakers in New York City. They created a toy based on the Berryman drawing, which they called "Teddy's Bear," and placed it in the window of their toy shop. It soon became a popular item, and to meet the immense demand for it they founded the Ideal Novelty and Toy Company. Interestingly, a toymaker in Germany, Richard Steiff, had also been creating animal toys, chief among which was one based on sketches he had done of bear cubs at the Stuttgart Zoo. He attempted to sell them at the Leipzig Toy Fair in March of 1903, but Europeans didn't seem to be that interested in his product. Even by this time, however, "Teddy's Bear" had become extremely popular in America, and an American buyer, obviously aware of the phenomenon, bought 3000 of Steiff's bears and brought them back to the States to sell. Though their design was different from the Michton bears, which were based on the Berryman cartoon, they still proved to be profitable, and only added to the craze. As early as 1906, the Michtons' term for them had morphed into the more familiar term "teddy bear," and was adopted by all manufacturers of the toys, including Steiff. Clifford Berryman, most likely seeing the popularity of the symbol he had created, continued to use it in his political cartoons for many years. 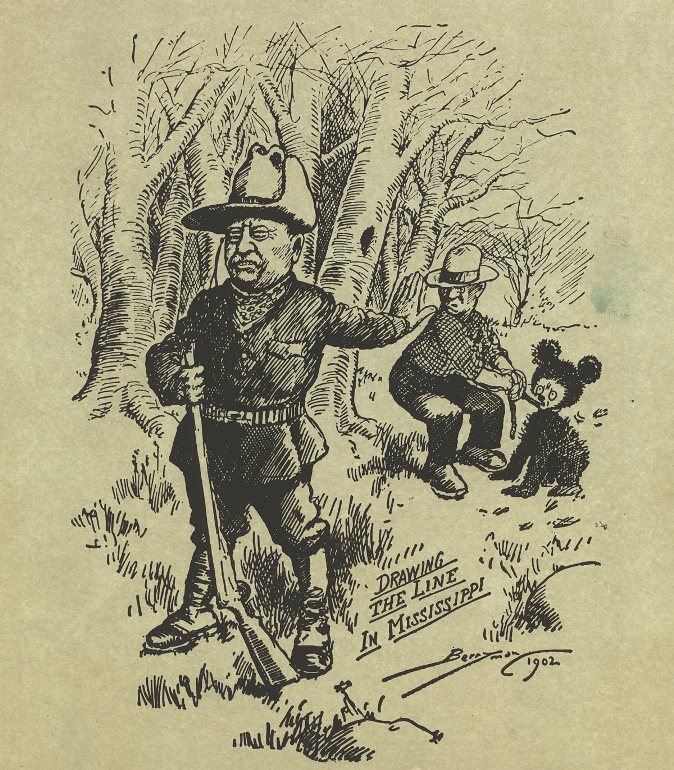 The bear can often be seen next to Berryman's caricatures of Roosevelt, sometimes supporting whatever action is being depicted, though other times appearing to act as Roosevelt's conscience in opposing or looking away from whatever is going on. Even after Roosevelt's presidency ended, Berryman continued to use the bear as a symbol of the former president's general attitude and policies, mainly as a way of comparing other politicians to him. Over the course of his career, Berryman created nearly 2,400 cartoons, many of which used common political symbols such as the Republican elephant and Democratic donkey, Uncle Sam, and John Q. Public, but the teddy bear appeared just as often. It didn't seem to have wide use by anyone other than Berryman, though by the end of his career it had morphed into something very different in the public consciousness. Either way, it remains an enduring symbol of childhood innocence, and shows no signs of fading in popularity.